1. De-clutter – It’s FREE. It could actually make you money if you host a garage sale to get rid of your unused stuff. Finding everything a “home” and clearing off the countertops and tables will make your space feel more airy and open. 2. New hardware – Changing out the knobs/handles/pulls on cabinetry and furniture is a sure way to make if feel fresh and new again. Just make certain the new choice fits into the same holes and you’ll be good to go! 3. Paint – Painting is my FAVORITE way to freshen up a home. In my book, you can paint anything and everything! Adding a fresh coat of paint to the exterior, interior, cabinets or even furniture will certainly give your home a breath of fresh air. 4. Crown molding – If your home doesn’t already have crown molding and you are looking for a way to add in some “wow factor”, look no further. It will instantly make your room pop and feel more luxurious. 5. Curb appeal – Nothing says spring like some fresh flowers on your front porch to welcome your guests. Make sure you also give the outside of your home a good scrub down, pull out any old/dead shrubbery and flowers, and clean out the gutters. Put out a fresh pretty door mat as well and you are all set. 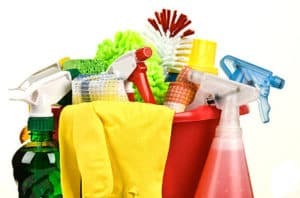 Once you tackle the Spring Clean, you may even decide that now is the time to put your home on the market! If so, give our Listing Specialist Andy Peters a call at 404-419-3619 to begin the process of selling your Metro Atlanta home today! ← Just Listed :: Gorgeous Traditional in Popular Peachtree Corners Swim/Tennis!